The holidays are upon us, and as usual, it’s pretty darn cold out! It’s the perfect time to stay at home, brew some hot cocoa, pile blankets on top of yourself, and binge-watch anime on Netflix or Crunchyroll. But it’s also a great time to get together with friends for some gaming fun. If you’re an anime lover who needs a new addition to your gaming shelf, or if you’re doing some holiday shopping for someone who fits that description, here are a few options I recommend. 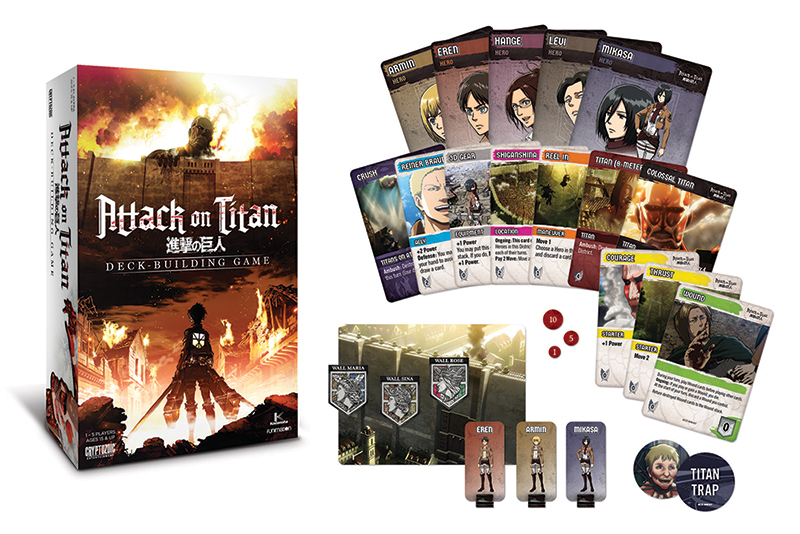 First off, there’s the Attack on Titan Deck-Building Game by Cryptozoic Entertainment, based on the popular anime and manga series. For those unfamiliar with Attack on Titan, it throws us into a world where humanity has been pushed to the brink of extinction by a race of colossal, carnivorous humanoids—the eponymous Titans—and the plot focuses on the few humans brave enough to defend mankind’s last, thrice-walled city against the Titans’ endless siege. Unlike most deck-building games, this one is fully cooperative, with the players working together to stop the Titans from breaking through the three walls of the city and feasting upon the hapless humans inside. It also introduces into the genre the unique concept of movement, as the players must maneuver their characters between districts of the city to buy cards for their decks and to battle the ever-present Titans who are constantly smashing their way through the walls. As with any good cooperative game, Attack on Titan is extremely difficult and relies on the players working together effectively, having a bit of luck on their side, and making difficult choices, like whether to continue defending a doomed wall or fall back to mount a stronger defense. The game does a good job of translating the feel of the source material into the often abstract realm of deck builders, and fans of the series will recognize this in the frequent character deaths and the almost demoralizingly strong opposition the Titans represent. Whether you like the series, you’re a deck-building veteran looking for a quality cooperative experience, or the thought of being eaten alive by savage giants appeals to you, look no further than the Attack on Titan Deck-Building Game. For those in search of lighter fare, the aptly named Tragedy Looper, localized by Z-Man Games would be a poor choice. But for anyone else, this game brings an element of mystery and deduction to the tabletop. A semicooperative game, Tragedy Looper pits up to three players against a single opponent, the Mastermind, who represents the pitiless weaver of fate itself. At the start of the game, the players witness a series of events that lead to a tragic ending, with almost no power to intervene. They are then sent back in time to the beginning of the scenario, using the knowledge of what they have seen to hopefully prevent the disaster from repeating itself. If they fail, they are sent back in time again, and so on. 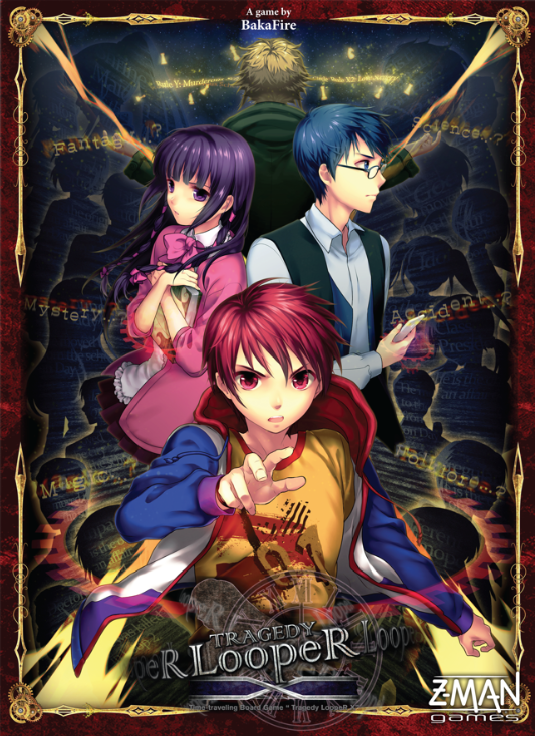 The artwork of Tragedy Looper is reminiscent of Japanese visual novel games like Steins;Gate and Fate/stay night, with the locations of the board and the characters who move between them each noticeably reflecting the visual style of these games. Key to the “story” of the game are the involved characters themselves, who have unique roles that are determined by the scenario the Mastermind has chosen but unknown to the players at the start of play. 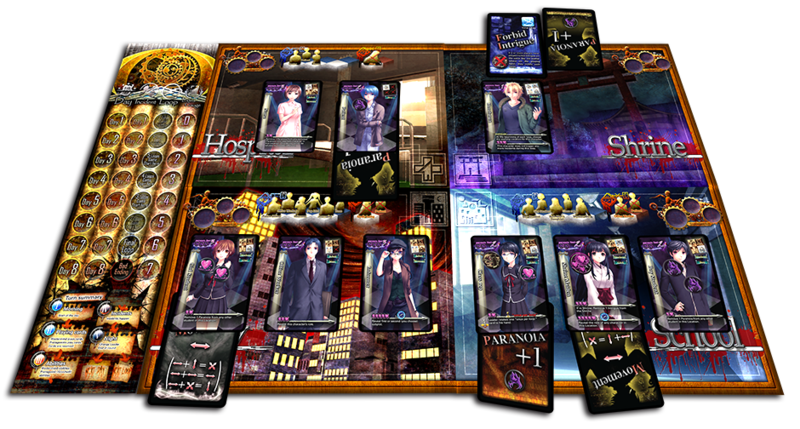 Both sides have access to cards that can be played onto the characters to influence their actions toward or away from the mystery events that are meant to occur. The Mastermind’s goal is achieved by making the tragedy play out as written in each successive time loop, up to a number of times specified by the scenario being used, while the other players must prevent this at least once to close the loop and achieve victory. While the game contains 10 scenarios in all, available expansions containing more scenarios and the ability to write your own keep the game fresh and entertaining each time. 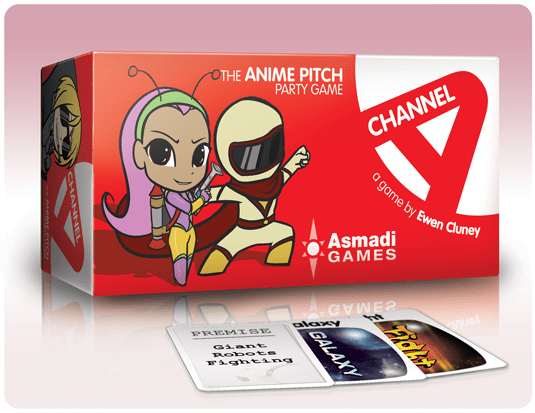 Each player (including the producer) must then craft an idea in their head of what their show is about and how it combines the two Premise Cards and then pitch that idea to the other players, as well as selecting Title Cards from their hand to compose the title of their anime. The Title Cards consist of everything from buzzwords like “Fullmetal” and “A Certain” to more general-use terms like “Nurse” and “Zero.” Creator Ewen Cluney has named Cards Against Humanity as a key influence in Channel A‘s design, but where the latter game outshines the former is in how players tend to walk away from Channel A feeling good about themselves. Anime is an ever-expanding interest, and these are just a few of the many great tabletop games capitalizing on its rising popularity. What are some games that you find capture that essential “anime” feel? Tragedy Looper seems pretty interesting.